Thirty years ago, Blondie were catapulted to fame with the release of two albums - Plastic Letters and Parallel Lines - which spawned career-defining hits like Heart of Glass, Denis, and Hanging On The Telephone. The US band split up in 1982, but made a triumphant return in 1999 with UK number one hit Maria, giving them chart toppers in three decades. Fronted by the effortlessly cool Debbie Harry, Blondie are marking their anniversary with a string of gigs and festival dates. The 63-year-old singer discusses the changing face of pop - and discloses the secret of long life in the music business. How does performing live now compare to 30 years ago? It's still pretty much the same, maybe easier these days than when we started. The UK festivals are a lot of fun and the audiences are terrific. Are there any moments from your stage career that stand out? Opening for Iggy Pop and David Bowie on tour when we started out was a big, big moment for Blondie. Are there any current acts that have grabbed your attention? There are so many it's hard to say! M.I.A. is terrific and I like Bat For Lashes. Blondie has had UK number ones in three decades. Is there any chance of adding to that? That would be nice, but the industry has changed. It's a different world right now. I don't know whether we'd get the push that newer artists do. With the right song, we'd get lots on play on the internet. It's a kind of divide and conquer situation. Do you have any plans to retire for good? Are you trying to tell me something?! I love writing songs and performing - so far so good. I guess it's all about demand and whether there will still be an audience for Blondie. I feel as though I'm better at it now than I ever was and enjoy it more. There's a duality between being a pop star and a musician, but whether one carries you through is debatable. I think the old timers really have something to offer. Seeing artists you grew up with gives your life a sense of continuity. I had a chance to see Nina Simone perform before she died and, come hell or high water, I got into that concert! Which musicians do you consider to be of your generation? I recently went to see Siouxsie Sioux in New York and she was marvellous - better than ever. So great. She's a unique freak [laughs]. I loved the show. Is there a secret formula for longevity in the music business? You just have to make the decision about what its value is to you, and what your own nature is and what makes you click. Those are the things that you hold on to, and the rest of the bull you just let go. 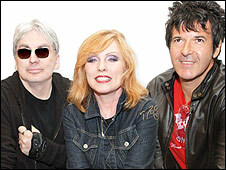 Blondie will be performing at the Latitude festival in Suffolk on 20 July and appear at the British Motor Show Music Festival on 28 July. Debbie Harry talked to BBC News entertainment reporter Michael Osborn.